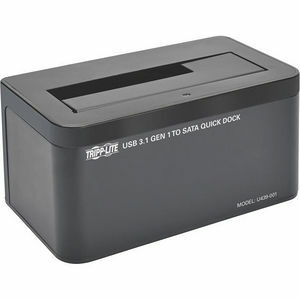 The U439-001 USB 3.1 Gen 1 to SATA Hard Drive Quick Dock allows you to quickly and easily add storage and transfer data to your computer, tablet, Ultrabook, Chromebook or laptop from a SATA hard drive. Just connect a 2.5-inch or 3.5-inch SATA HDD (Hard Disk Drive) or SSD (Solid State Drive) to the dock's top port, connect the USB-C port to the USB-C port on your device using the included 3-foot cable, connect the external power supply to the dock and an AC power source, and turn on the rear on/off switch. A blue LED will indicate a solid connection with your device. The dock accepts SATA III (6 Gbps), SATA II (3 Gbps) and SATA I (1.5 Gbps) drives, including 2.5-inch and 3.5-inch SATA HDDs and SSDs of all capacities (tested up to 6 TB). It supports USB 3.1 Gen 1 data transfer rates up to 5 Gbps, and is backward compatible with previous USB generations. Works right out of the package with no software or drivers required. Compatible with all major operating systems that comply with USB standards.